« My Trekinetic K-2 – the perfect privacy zone! 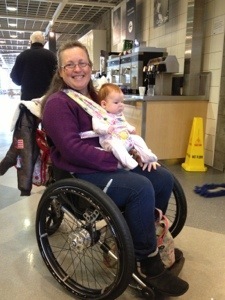 How to travel with baby in a wheelchair…..
Having five grandchildren who regularly go out and about with us has meant that I needed to be inventive to find the best possible transportation methods without losing the use of my hands to push myself around. I am a little independent and prefer pushing myself whenever I can so a number of options have presented themselves over the last couple of years. Firstly, I made a couple of ring slings which are amazing when baby is really little as they can lie down all cozy. Secondly, as they got a bit more head control my Cath Kidston messenger-style handbag was perfect and they were neatly tucked into the bag together with all my other bits and bobs – this one is very popular with passersby and elicits many smiles for ‘baby-in-the-bag’. Thirdly and ad hoc when I cannot find the sling is a towel or easily accessible piece of fabric simply wrapped and tied around me and baby – only good for around the house really. And finally, but my favourite is the fabric baby sling/wrap which I made recently and can be used with baby facing towards you, away from you or on your back. This is really secure and comfortable because of the wide straps across your back which distributes the babies weight really nicely; and best of all – it frees your hands to keep mobile and other important tasks – like making a cup of coffee after a day out shopping! Here we have one beautiful baby being sported around using the front-facing technique – a great option as they get a bit older and more curious about their surroundings…..
My daughter is expecting to deliver her son in the next two weeks. Once he gets old enough I look forward to doing the same. In reference to your latest blog it is great to contribute. Cheers! I am so excited for you. Get yourself one of the fabric slings and you can carry them around from new born which is so special. All the best to your daughter for the big day. thanks lovely for your comment on my ‘about’, your blog is so inspirational! i am in awe of all you do. i’m lucky i have time at the moment to get back into creativity, while i’m just studying art. love your blog. You are amazing, girl! 🙂 Inspiring me to tears!